Bushmeat is often defined as the meat derived from wild animals, including terrestrial mammals, birds, reptiles and amphibians, harvested for subsistence or trade, most often illegally. It is a freely accessible source of food that can be captured rather than bred and often represents both the primary source of animal protein, as well as the main cash-earning commodity for poor families living in the tropical rain forest regions. The current demand of the growing human population greatly outstrips the availability of bushmeat in most regions, and with no effective regulation, hunting is largely unsustainable. As a result, wildlife populations are declining almost everywhere. While the international trade in bushmeat currently represents a small part of the total trade, it is thought to be increasing, driven by the emergence of an illegal luxury market outside Africa. The lack of effective tools for the detection and control of illegal meat imports is limiting the effectiveness of law enforcement efforts to prevent this luxury bushmeat market from expanding. To mark the mid-term review of the European Union Action Plan on Wildlife Trafficking, an exhibition entitled 'Stop Wildlife Trafficking' was organised in the corridors of the European Parliament buildings in Brussels from 9 till 11 July 2018. Multiple partners designed posters and brochures providing information on the scale and impact of wildlife trafficking, as well as recommendations to tackle this issue. In addition, two documentaries broadcasted on October 3rd 2018 on the Belgian national TV exposed the availability of bushmeat in Brussels, i.e. 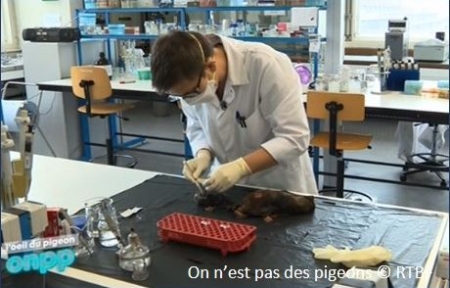 'Pano' (by VRT NWS) and 'On n'est pas des pigeons' (by RTBF). In an undercover operation, the Pano team also travelled to the DR Congo and had little if any problem to import bushmeat in Belgium in their luggage. Bushmeat hunting and poaching are of major concern and can be a greater threat to wildlife conservation and species survival than habitat destruction. Mammals generally make up the majority (> 90 %) of bushmeat in terms of numbers of individuals and biomass, with large rodents and ungulates representing the bulk of the carcasses. In the Congo Basin an estimated 1 to 3.4 million tonnes of wild meat are harvested annually, i.e. about 6 times the amount that supposedly can be harvested in a sustainable way. In general, bushmeat markets follow the growth of extractive industries that trigger the immigration of workers and their families to remote areas, and increase accessibility by opening up previously unreachable forests to hunters with new road networks. In addition, wars, uprisings and other emergencies also have a significant impact, since refugees often have little choice in what they eat. While bushmeat hunting is predominantly a poor man’s activity, eating wild meat is not. Increasing urban consumers demand for bushmeat has catalysed a booming commercial trade which has led to unprecedented, continuously increasing, hunting pressures. This urban demand is often driven by the wealthy elite willing to pay high prices to eat bushmeat, not as a dietary necessity, but as an occasional delicacy or luxury item. In addition, widespread organised trade networks feed the international bushmeat demand. Reliable information on the true scale of the international bushmeat trade is lacking. However, bushmeat import in Europe is probably much higher than suspected up to now. Bushmeat products intercepted in Europe comprise of a wide range of species, many of which are CITES-listed, including primates, rodents, antelopes and elephants. The bushmeat trade is also of public health concern since up to 75 % of emerging infectious diseases in humans are of zoonotic origin. 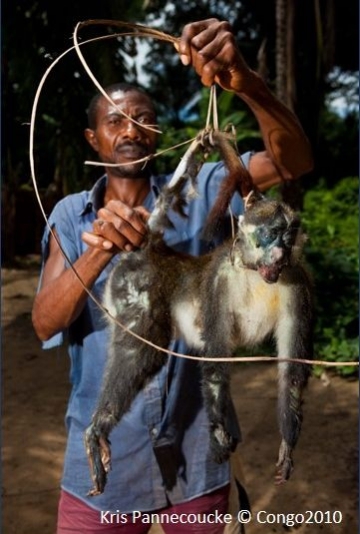 The butchering of bushmeat, particularly primates, has been implicated in the transmission of several zoonotic pathogens including SIV, SARS and Monkeypox. Consequently, the international bushmeat trade from West and Central Africa into Europe, Asia and North America might pose human health risks due to the possible presence of infectious agents. The text in this background section is based on the posters about the bushmeat trade presented at the “Stop Wildlife Trafficking” expo organised at the European Parliament in Brussels from 9 till 11 July 2018. These posters are a result of a collaboration between the Belgian National Focal Point for the Convention on Biological Diversity, the Royal Belgian Institute of Natural Sciences, the Royal Museum for Central Africa, WWF-Belgium, WWF-Europe, the World Conservation Society, the International Fund for Animal Welfare, TRAFFIC (the wildlife trade monitoring network), the Botanic Garden Meise, Brussels Airport, the University of Liège, and the Belgian Federal Public Service Health, Food Chain Safety and Environment. 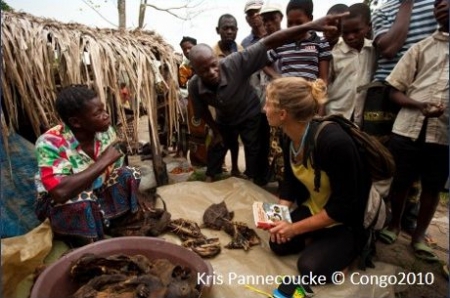 In the framework of the two TV documentaries broadcasted on October 3rd 2018, journalists working for VRT and RTBF bought “undercover” several pieces of meat sold as bushmeat in Brussels and Kisangani. The bushmeat pieces were smoked and too small, making morphological species identification nearly impossible. In such cases, DNA barcoding is a reliable alternative tool to identify the animal species involved. Therefore, this method has become widely applied in forensic investigations. DNA barcoding is an identification technique described by Hebert et al. (2003). The method is based on the observation that usually DNA sequence divergence among different species is larger than among individuals from the same species. Thus DNA sequences can be used as species-specific barcodes, comparable to the product barcodes used in shops. In order to do so, it is customary to sequence a ±650 base pair long fragment of the cytochrome c oxidase enzyme (COI) gene in the mitochondrial genome. This COI sequence is then compared to COI sequences in reference databases like GenBank and BOLD. Evidently, other DNA fragments can be used for identification purposes, as well. The choice of the DNA fragment used for species identification depends on the availability of reference sequences in the databases and the taxonomic identification level required. 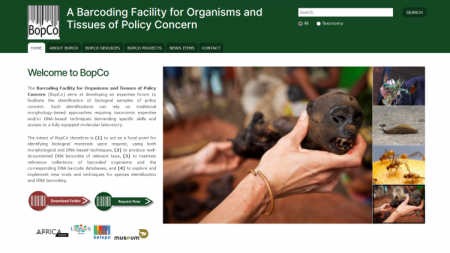 In the case of the bushmeat purchased for the two TV documentaries, the Barcoding Facility for Organisms and Tissues of Policy Concern (BopCo) used COI and cytochrome b sequences for species identifications. This showed that bushmeat of CITES-protected species is for sale in Brussels. In addition, it confirmed that the bushmeat bought on the market in Kisangani and smuggled into Belgium was chimpanzee, a species which is both endangered and protected. BopCo was contacted by journalists from VRT NWS and RTBF because of its know-how on DNA-based species identification and the expertise on the subject present at the Royal Belgian Institute of Natural Sciences (RBINS) and the Royal Museum for Central Africa (RMCA). More information on the BopCo project “Exploring the Bushmeat market in Brussels” can be found on the respective project page and on the RBINS website. BopCo acts as a focal point for identifying biological materials upon request, by providing access to the expertise and infrastructure necessary to identify organisms of policy concern and their derived products. Identifications can rely on traditional morphology-based approaches employing the taxonomic expertise and specimen collections at RBINS and RMCA. However, when morphological identifications are not possible (e.g. early life stages, cryptic species, processed food items), DNA barcoding can be used to achieve reliable species identifications. Evidently, other DNA techniques can be applied to identify the biological materials, as well. To perform DNA-based species identifications, BopCo has access to fully equipped DNA laboratories at both RBINS and RMCA. Gombeer, S., Backeljau, T., De Meyer, M., Musaba, P., Nebesse, C., Ngoy, S. & Verheyen, E. ‘Bushmeat for sale in Brussels’. Poster presented at the 25th Zoology Congress, 14-15 December 2018, Antwerp, Belgium and at the 18th Meeting of Partners of the Congo Basin Forest Partnership, 27-28 November 2018, Tervuren, Belgium.